Looking for a fun, provocative evening filled with bold performers who all share a commitment to health justice? How about an event where you can connect with your community and celebrate shared values? Join us for the 6th Annual variety show and fundraiser, Acting Out – For the Health of It. Tickets and sponsorships available now! 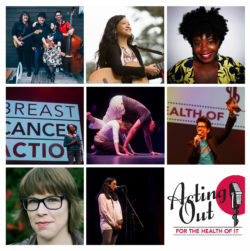 We’re excited to announce that, in addition to stunning dance performances and moving readings from Breast Cancer Action members, Acting Out will feature a set of talented and dynamic performers whose projects stretch their creativity, passions, and important social justice work across genres, art forms, and cultures. Kelly Anneken is an Oakland-based funny person and all-around swell gal who performs standup comedy. Kelly has appeared at SF Sketchfest, Green Gravel Comedy Festival, and Boston’s Women in Comedy Festival and is well-known as the co-host of two internationally popular TV recap podcasts, Up Yours, Downstairs! and Red All Over. San Francisco’s Mad Mama and the Bona Fide Few are best described as “whiskey-soaked Americana.” Fronted by Mad Mama, “the perfect blend of smart and crazy which makes her both desirable and dangerous,” they perform original songs and feature music from artists like Johnny Cash, Social Distortion, and Hank Williams, Sr.
Aireene Espiritu is a singer/songwriter playing mostly original songs accompanied by Latin/African rhythms, folk and bluegrass pickings and inspirations from gospel music – a mix of stompin’, swayin’, and timeless Americana. Born in the Philippines, she moved to the US at 10 years old, growing up in the third culture: the old country, the new country and a blend of both worlds. Join us for the VIP reception before the show, and savor delicious hors d’oeuvres, refreshing beverages and Aireene Espiritu’s exclusive musical performance! Get your tickets today! We look forward to Acting Out with you March 15! P.S. Purchase more than three tickets and you’ll get one free entry into our drawing for fabulous prizes, including two season tickets to San Francisco’s acclaimed Magic Theater.